Discover the rare, the curious, and the authentic. Learn about American history and innovation. Make connections among history, art, and science. At the American Philosophical Society Museum, visitors will see exhibitions drawn from the Society’s renowned collections that trace American history and science from the Founding Fathers to the digital age. Holdings include over 2.5 miles of manuscript pages and approximately one million rare books, prints, photographs, paintings, scientific instruments, Native American language recordings, and other objects. Past exhibitions have featured items such as Thomas Jefferson’s hand-written draft of the Declaration of Independence, a notebook from Lewis and Clark’s Western exploration, a rare 18th-century telescope, Darwin’s hand-written title page for On the Origin of Species, and the only known portrait of Benjamin Franklin’s wife Deborah. Each exhibition offers imaginative programs that interpret the historical themes and objects on view and connect them to relevant issues in the world today. APS Museum exhibitions are open to the public every year from mid-April through December, Thursdays through Sundays. The APS Museum is closed to the public Monday through Wednesday. We offer school and group tours during those days. Learn more about how to schedule a class visit or guided tour, available Monday through Wednesday, here. Enter from either Fifth Street or Independence Courtyard (behind Independence Hall). Both entrances require a brief, non-invasive security screening. Our Fifth Street entrance is our accessible entrance. There, we have a wheelchair lift (capacity of 495 lbs) and easier access to an elevator. If you have questions about accessibility, email museumeducation@amphilsoc.org. Guided tours of of the 2019 exhibition Mapping a Nation: Shaping the Early American Republic are now available for booking. Tours for groups of 5–20 guests may be scheduled Monday–Wednesday, 10:00 a.m.–4:00 p.m. (subject to availability). Tours cost $2.00 per child (below the age of 18) and $5.00 per adult. Two weeks or more advance notice is required when scheduling tours. For detailed information and to request a tour, please click here. The APS Museum has a historically significant collection of approximately 3,000 artifacts and fine art objects. The collection reflects the central role of the APS and Philadelphia in the founding of the nation as well as the development of science and technology from the 18th century through the early 20th century. 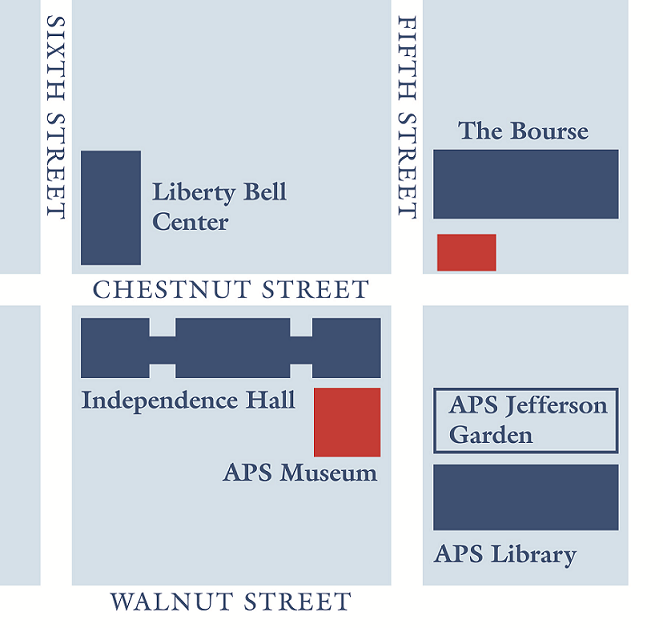 Significant holdings of the Museum collection include portraits of Founding Fathers; models of inventions; scientific instruments made by or relating to David Rittenhouse and other APS Members; plant specimens collected by Lewis and Clark; and several of Benjamin Franklin’s personal belongings, such as a set of stencils, tall case clock, chess set, and library chair with fold-out steps. Objects in the collection were acquired predominantly through past APS Members and scientific activities of the Society. APS. Gift of David Rittenhouse, 1818. American Philosophical Society, Gift of Charles Pemberton Fox and Mary Fox, 1840. David Rittenhouse, 1769–1769 Copper alloy and iron H 36 x W 25 x L 34 inches APS. Gift of David Rittenhouse, 1818. Philadelphia astronomer and surveyor David Rittenhouse made this telescope for his observation of the 1769 transit of Venus across the sun. He used the transit telescope, mounted on protrusions called trunnions so that it could rotate in a vertical arc, to monitor the passage of the sun over the meridian, thus determining solar noon. The telescope helped Rittenhouse maintain the accuracy of his astronomical clock both in his observatory and in the field. This device, presented to the APS in 1850 by one of Jefferson’s law students (and husband of his granddaughter), was reportedly owned and used by the president. This ”polygraph,” meaning ”writing of many,” helped relieve the tedium of copying documents by hand. As the author of the original document moved one of the polygraph pens, the other moved simultaneously, producing an exact copy. John Isaac Hawkins patented the device in 1803, and Thomas Jefferson and Charles Willson Peale promoted its use. Jefferson, who wrote thousands of personal and professional letters, was a particularly enthusiastic endorser of the polygraph. Josiah Wedgwood, c. 1787 Pottery (jasperware) H 1.25 x W 1.125 x D .125 inches American Philosophical Society, Gift of Charles Pemberton Fox and Mary Fox, 1840. Press information for Mapping a Nation: Shaping the Early American Republic.